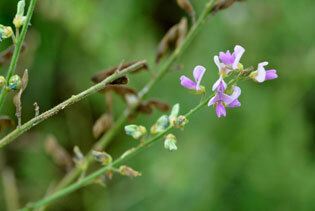 Desmodium sessilifolium (Torr. ) T. & G.
Stems: Erect or ascending, 1-several from base, ridged longitudinally, simple to inflorescence, branching above, densely covered with minute hooked-hairs. Leaves: Alternate, nearly sessile, 3-foliolate; leaflets linear to linear-oblong, prominently net-veined and short-hairy beneath, minutely hooked-hairy above; terminal leaflet 1.4 to 3.6 inches long, 1/4 to 3/4 inch wide, tip rounded; lateral leaflets 1.2 to 2.4 inches long; stipules lance-tapering, 1/6 to 2/5 inch long. Inflorescences: Raceme-like panicled, terminal; branches long, slender. Flowers: On short stalk; calyx 2-lipped, minutely hairy; upper lip entire or notched; lower lip 3-lobed, middle lobe longer; corolla papilionaceous, pinkish, pale lavender or sometimes whitish, fading yellowish-white, 1/5 to 1/4 inch long; stamens 10, 9 united, 1 free. Fruits: Pods, flat, jointed; segments 1-4, rounded above and below, surfaces with minute hooked hairs; seeds 1 per segment, smooth, olive to brown. Habitat: Prairie hillsides and ravines, rocky open woodlands, sandy stream valleys, and roadsides; dry soil. Comments: From Latin, sessilis "pertaining to sitting" for the leaf blade sitting close to the stem.